Last year, shortly after Google Earth was released, a bunch of Tour de France (TdF) fans in the Google Earth Community (GEC) put up the complete route of the 2005 TdF. The race was still going on while they were completing it. 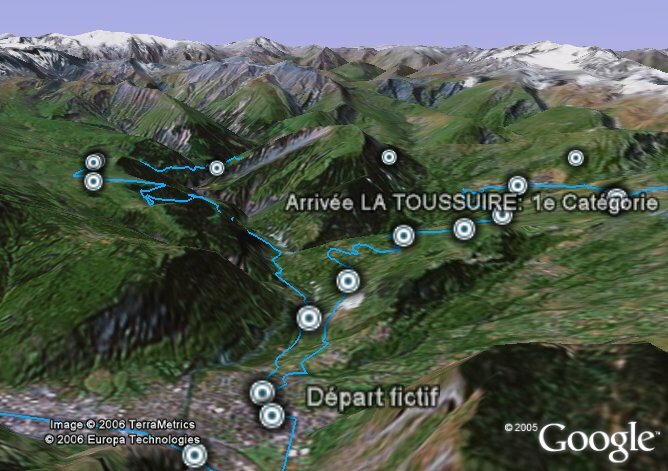 This year, the complete TdF 2006 course has already been mapped in Google Earth well ahead of the July 1st start (see the official TdF 2006 web site). It's a network link, so any refinements will get updated automatically, so save it in your "My Places" if you plan to follow the race. Once it loads, you will just see the tracks for each stage. For more details open up the folder and turn on each stage's detailed placemarks showing the checkpoints. You can check out the satellite photos, but more importantly make sure you use the pan/tilt features in GE so you can see the mountains they go through. Thanks to 'lucifer666' at the GEC, who also did the Volvo Ocean Race network link. Read other interesting Google Earth stories in the following categories: 3D Models, Flying, Sailing, Science, Sightseeing, Sports, Tips, and more. This is sure easier than trying to find the different spots in the Giro d'Italia. Good link, and a lot better than my attempt last year. great link - i recently became hooked on google earth, i find it utterly fascinating - that's how i found this site in the first place. i still can't believe how accurate the technology is, that i can track the tour de france from my office. (it's even more amazing that my boyfriend tells me Google Earth gets its data from Tele Atlas, the same company that makes the map for the GPS in his car! No wonder he's gotten lost a lot less since he got that thing.) Wow! Hey Cindy...LOL! Very funny comment about your boyfriend getting lost a lot less since he got a GPS. Here some information obaut how the route for this year Tour de France where created. The core information is published of the site www.letour.fr. Coordinates for this list of places are taken from a navigation programm, in this case Viamichelin. This is the list you can find under the �Waypoints� folder in each stage. Finally i analyse the resulting track at www.gpsvisualizer.com to find out the length of the track. So basically I use different resources to combine the available information. Some being only available recently (driving directions from GE and GPSvisualizer). To refine the work I upgraded to GE-Plus to be able to edit the resulting track within GE for more confort. GREAT stuff! It will make watching Le Tour this year a lot more fun! Question: Since the tour organizers publish the "crossing times" of the riders based on a range of speeds, is there any way to S-L-O-W the "Play Tour" speed down to the cycling speeds so that it would move/track (aprox.) as the riders did? OMG This is glorious! You guys are my heroes! Is there a way to see the profile of each race? Maybe attach a PNG as a photo for each stage? I wish we could do a flying tour of each stage at an 80 degree camera angle, following the course, following the touring directions you created. But when I try, I get the straight down 0 degree view. It would also be nice if we could get an elevation profile we could play with. superb and well done for all the hard work. Just wanted to say this is amazing!! Great link - thanks for sharing! When you Google Earth in any spot, one does see what a great place this is to live compared to , oh say, the moon or mercury. Water, wind, moderate temps, clouds, sweetgrass, rivers and trees. Amazing lifeforms in a good way which often would exlude the hairless apes that spend most of their timing tormenting other hairless apes out of their money.